Lori Phillips didn’t join IUPUI’s museum studies program to invent new ways to increase access to the beauty, the knowledge and the cultural impact of past museum collections. Things just worked out that way for the graduate student in the IU School of Liberal Arts and a group of passionate cohorts. Lori Phillips explains how she got started as a Wikipedian in Residence. But the Virginia native and a cadre of digital cadets around the world are looking to harness the power of Web giant Wikipedia to restore broader access to exhibit content that has been moved out of the public eye and into storage areas, to open up those stories to a new generation of people — many of them young students — who never got to experience them when they graced museum floors. such facility. She is determined to increase access to the information and collections that once were reserved for physical institutions like galleries, libraries, archives and museums — GLAMs to insiders —to create a digital world of exploration through Wikipedia that will preserve knowledge for future generations, such as her four-year-old son Teddy. Phillips didn’t envision herself as a Wikipedian, but a project through a museum studies’ collections care and management course opened a new door. She and classmates wrote 40 articles about public art on the IUPUI campus. “We had to research the provenance for each piece, outline their condition, name, the artist, and so forth,” she says. Phillips “was inspired by the premise that Wikipedia could be a platform highlighting public artworks ‘hidden in plain sight.’” The students’ work was featured in The Chronicle of Higher Education, a noteworthy achievement; that led to a second project at the Indiana State House, which garnered more attention for the program and its students. The work whetted her interest in Wikipedia, which Phillips says has the informal but ambitious goal “to gather the sum of all human knowledge and make it available on line.” That appeals to both her love of history and of teaching; she once trained to be a teacher while attending George Mason University near Washington, D.C.
Phillips uses her web skills to make stored-away exhibits and artifacts available to audiences around the world. The public art project led Phillips to a growing global initiative known as GLAM-Wiki, made up of volunteer Wikipedians who assist cultural institutions in sharing research with Wikipedia. The project involves such prestigious institutions as the British Museum and the Smithsonian. Because of her work at the Children’s Museum, Phillips has emerged as a leader in this now-popular project, initiating best practices that have been implemented around the world. “I’ve never been the ‘cool kid’ that got a lot of attention before,” she laughs. olds who do project-based work related to the Children’s Museum. “The MAP students are enthusiastic about sharing the museum’s resources through Wikipedia, where they know people all over the world can see their work. They take the project very seriously,” she says. The MAP youths “have created five substantial Wikipedia articles about the museum’s iconic objects,” Phillips says proudly. Those new articles helped launch QRpedia codes throughout the museum, digital signage posted within museum exhibits. Visitors use digital devices to scan the QR codes, downloading Wikipedia articles that have greater depth than the signage can offer. The articles “allow children in China or teens in Thailand to learn about Bucky the Teenage T. rex (a popular feature in The Children’s Museum’s Dinosphere) or glass-blowing artist Dale Chihuly’s Fireworks of Glass,” Phillips says, referring to Chihuly’s dazzling multi-story glass sculpture within the museum. 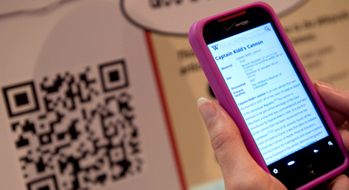 QR codes provide more background information, historical data and details for museum visitors through their digital devices. The Wikipedia initiative is increasingly important in an era when Encyclopaedia Britannica just ended more than two centuries of printing encyclopedias. “Wikipedia has the ability and the desire to help us share our collective knowledge, and the cultural resources held in museums should be part of that information,” she says. Wikipedia’s desire to play that cultural role is obvious. Her work has earned Phillips a new role, as well. She is the 2012 U.S. Cultural Partnerships Coordinator for the Wikimedia Foundation, the umbrella organization of which Wikipedia is a part. Phillips is helping build an infrastructure for American cultural institutions to collaborate with Wikimedia. IUPUI Magazine is published biannually by IU Communications.